Steven Wright (L) and Bill Holdsworth (R) on Mount Suribachi, Iwo Jima, flanking their friend and Iwo Jima survivor, Carl DeHaven. Mr. DeHaven (of League City, TX) served with the Fifth Marines on Iwo Jima and Guam. On February 19, 1945, the first of 70,000 U.S. Marines landed on the Pacific island of Iwo Jima, to face over 20,000 determined Imperial Japanese defenders. By the time it was over thirty-six days later, Americans had suffered over 26,000 casualties, of which more than 6,800 were killed. Japanese losses were staggering: of the nearly 21,000 defenders, only 216 were captured alive. 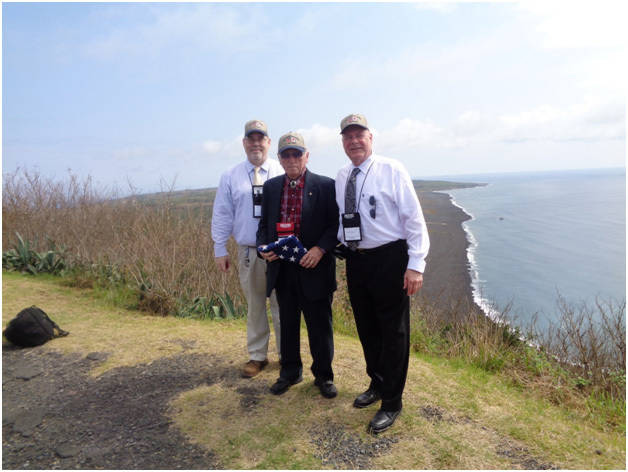 In March 2015, as part of the joint American–Japanese 70th anniversary “Reunion of Honor” ceremonies, independent historians Steven J. Wright and William C. Holdsworth visited the island with more than fifty veterans of the battle—including one Japanese survivor, Tsuruji Akikusa—and the last surviving Iwo Jima Medal of Honor recipient Hershel “Woody” Williams. Holdsworth and Wright presented their experience in the program: Return to Iwo Jima. Steven J. Wright has authored two books and over 300 articles and reviews on the American Civil War. He holds advanced degrees in American History and American Indian Studies, and Library and Information Science. He is a member of the faculty of the Civil War Institute of Manor College, and is a member and past President of the Old Baldy Civil War Round Table of Philadelphia. William C. Holdsworth attended Montgomery County Community College, and has made a successful career in Sales & Marketing in the record business, working for RCA Records, PolyGram Records, and the Universal Music Group. He and his wife have three sons, one of whom is a U. S. Marine. Bill is a member and former Vice President of the Old Baldy Civil War Round Table of Philadelphia. This entry was posted in Meeting archive on January 6, 2016 by hlj.